How to get rid of mice and keep them out of your home. Proven tips to get rid of mice quickly and safely. How Do Mice Get In? Do you have a big heart & love all creatures big or small? Does the thought of snap traps or a planned mouse electrocution give you the willies? The humane mouse traps on this page were designed with folks like you in mind. You don’t need to have murder on the brain to be successful in getting rid of mice from your home. There are many no-kill mouse traps that will catch mice without causing them harm. 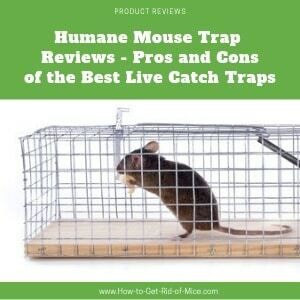 We’ve reviewed the top 3 humane mouse traps and provided the pros and cons for each. All three traps allow you to visually see when you catch mice, so you can release them quickly. This is important to keep the pest control process as humane as possible. Also included are great tips to get the best use from your no-kill mouse trap. The Havahart Mouse Trap or as some like to call them Have a Heart mouse traps are a wonderful solution for anyone that just can’t bear to hurt a living thing. The traps are made from wire mesh and reinforced with steel so they are very sturdy. These humane mouse traps were designed to be safe for both you and your family as well as the mice. Havahart mouse traps have two doors on either side of the trap. They are positioned so a mouse can enter from either side. The bait table is in the center of the trap and connected to the doors by a sturdy wire. Once the mouse enters the trap and triggers the spring mechanism, the doors snap closed, catching the mouse inside. The traps are large enough so the mouse can move inside. The wire mesh provides good air flow, so the mice don’t suffocate while waiting for you to release them. The traps are reusable from year to year. The trigger is sensitive to help catch the mice the first time they enter the trap. The traps only catch one mouse at a time. Requires some practice to set the trap. When you bait this trap, it is helpful to place a small dab of peanut butter in the middle of the bait plate, then add a nut or candy on top. This helps the bait to stay centered on the bait plate. 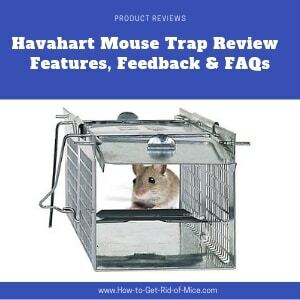 Read our full review on the Havahart Mouse trap to get more tips and watch the video that shows exactly how to set the trap. The Smart Mouse Trap is the prettiest of the humane mouse traps. 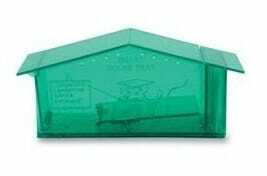 It is made from green, transparent plastic and is shaped like a slim little mouse house. This mouse trap has the distinction of being recommended by Humane Societies and Animal Rights organizations both in the United States and worldwide. There is a stainless-steel spring under a plastic platform that snaps the trap door closed after the mouse steps on the trigger plate. You place the bait in a removable “door” between 2 pieces of plastic, so the mouse does not actually eat the bait. Choose one of the stronger smelling mouse trap baits when using this trap. 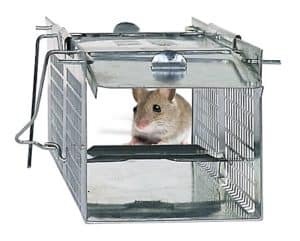 Larger than other types of “humane” mouse traps like the mice cubes or tip and trap versions. Includes ventilation holes in the top, so the mouse has enough oxygen to survive for a little while before you release him. The latch that keeps the door closed is made of plastic. Some owners reported the mouse chewing through the latch so the door won’t stay closed. It’s a little tricky to set until you get the hang of it. The trap door mechanism is not super sensitive and may not be triggered when catching smaller mice. You can place a penny or dime on top of the trigger plate to help add some weight. 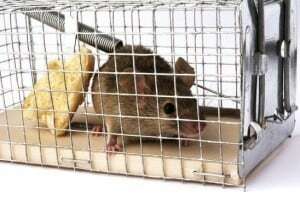 In addition to placing bait between the plastic plates, you can add a few cracker crumbs or pet food in the back of the trap to entice the mouse to enter & give him a snack while he is waiting to be released. The Mice Cube is a no-kill mouse trap made of a semi-clear hard plastic rectangle box. This mouse trap has a very simple design that is the easiest to use of all the humane mouse traps. The mice cube has one door made of light plastic that swings inward when the mouse enters the trap, then closes behind him. The door only swings one way, so once inside, the mouse can’t get back out. You place the bait in the far end of the trap to entice the mouse to enter. Easy to use design that doesn’t require any setup. Just add bait & it’s ready to use. No ventilation in the cube, if the mouse is not released within hours it will suffocate. Difficult to clean, especially since the opening is so small. The mouse will be stressed when trapped in this mouse trap and will make a mess. The best way to clean it is to give it a good long soak with hot, soapy water, then use your kitchen sprayer to get the muck out. To make this a better humane mouse trap, you should drill a few holes in the plastic cube. You will still need to empty the trap very quickly so the mouse doesn’t suffer, but this will help a little. Which is the Best Humane Mouse Trap? So, which is the best humane mouse trap? The Havahart model gets our vote. Why? For the simple reason that it is the safest, most humane version of the live mouse traps. The wire mesh design allows mice to get plenty of fresh air after being captured. After watching one too many mice suffer from being stuck in a plastic trap too long, this is the choice for us. If you have time to check your mouse traps more often than once a day, then the Smart Mouse traps is a close second. Whichever humane mouse trap you prefer, you can sleep easier at night knowing you have been kind to all – even the littlest mouse. This website uses affiliate links and may receive a commission if you purchase products. Learn more on our Affiliates Disclaimer page.